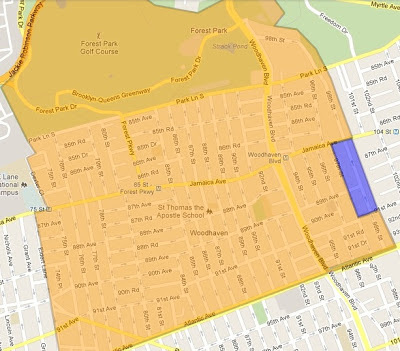 The Woodhaven Residents' Block Association has submitted testimony to the NYC Districting Commission, praising the body's proposal for placing nearly all of Woodhaven within the same City Council district. Currently, the neighborhood is divided between two districts. The Commission's draft map leaves only a small segment of Woodhaven outside the district. With the Districting Commission holding a hearing in Queens this week, the WRBA testified that the proposed lines would represent significant progress, though there is still room for improvement. under the proposed City Council lines. "We are firmly in favor of the way the Districting Commission's Preliminary Draft Plan unites nearly all of Woodhaven. It is a huge step forward," the WRBA states in its testimony. "Though we are generally pleased with the way Woodhaven's proposed district lines are drawn, we would prefer that no part of Woodhaven be separated from the rest of the neighborhood." Approximately 98% of Woodhaven would be placed in District 30, which is currently represented by Council Member Elizabeth Crowley. The remainder would fall into District 32, which is currently represented by Council Member Eric Ulrich. Currently, Crowley and Ulrich each represent roughly half of Woodhaven. The small portion excluded from District 30 by the proposed lines includes 98th Street between Jamaica Avenue and 91st Avenue, as well as nearby stretches of 97th Street, 89th Avenue, 91st Avenue, and Jamaica Avenue. The WRBA's testimony advances several arguments for placing the remaining 2% with the rest of Woodhaven. "We understand that not all neighborhoods are happy with the proposed lines. As the draft map undergoes modifications, we encourage the Commission not to make any sweeping changes that would undo the good work it has done regarding Woodhaven," the testimony reads. "The proposal, however, is not perfect, and we hope that the Commission finds a way to keep every square block of Woodhaven in the same district, which its initial proposal almost—but not quite—managed to do." The full text of the WRBA's testimony before the NYC Districting Commission can be read here.